First, I created a simple card with similar colors, inspired by the oranges and pinks. The feathers are 2-step, so the feather is stamped first and then the dots are stamped after. So fun! OTHER: seam binding, chipboard stars by Studio Calico. 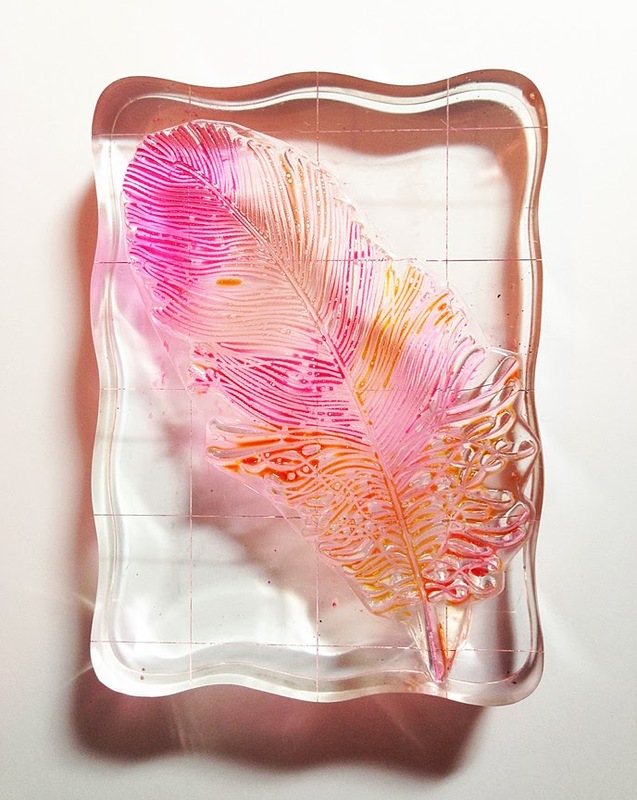 Next, I wanted to step up the look to resemble the inspiration photo a little bit more, so I painted my feather stamp with ink refills to create that watercolor look. I used a drop of Raspberry Fizz, a drop of Sweet Blush, a drop of Summer Sunrise and a drop of Harvest Gold refill ink in my paint palette. 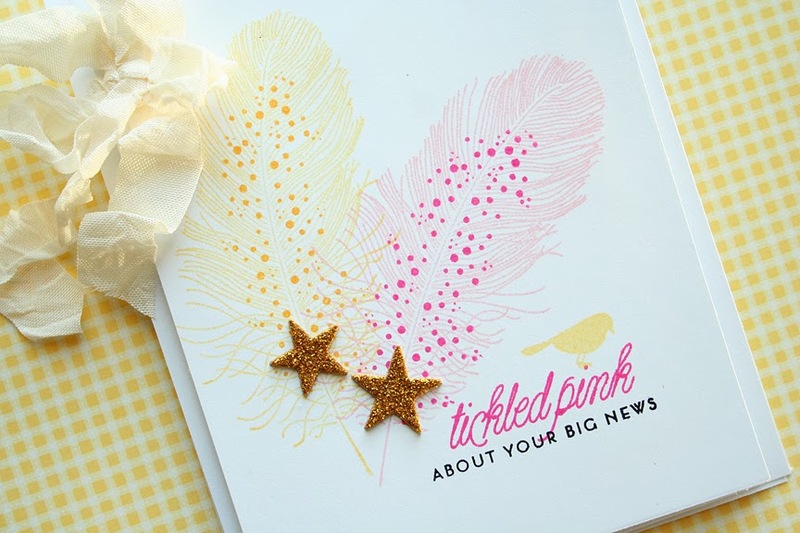 Using a paintbrush, I dipped the brush in a drop of Raspberry Fizz ink refill and painted the top of the feather, then Sweet Blush, Summer Sunrise and Harvest Gold - just randomly painted them all over the feather. I flipped it over and stamped it onto my white cardstock at an angle. Voila! And here is the finished product. 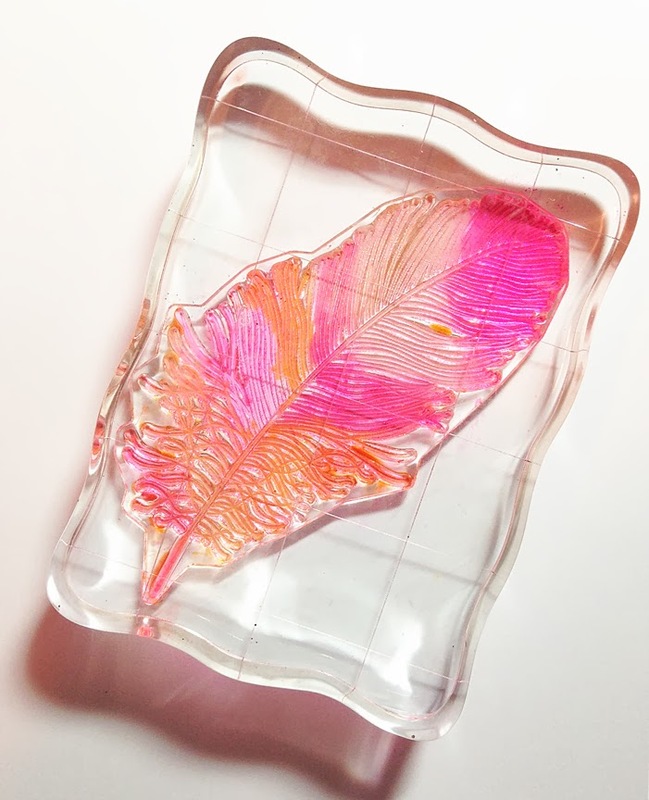 Now you can't see all of the super fine detail of the feather with this technique, but still a cool one to try! Love the effect! It turns out different every time. Wouldn't a set of matching cards be really cute with all different sayings? After they were dry, I used the dotty stamp over the top with Versamark Ink and heat embossed the dots with gold embossing powder. A sequin and a sentiment finishes the look. Sequins are from Pretty Pink Posh! Just a note: the reinkers may stain your stamps, but I've found that fingernail polish remover works great to get some of it off. Keep a wipe handy to clean your stamps right away to prevent most staining. 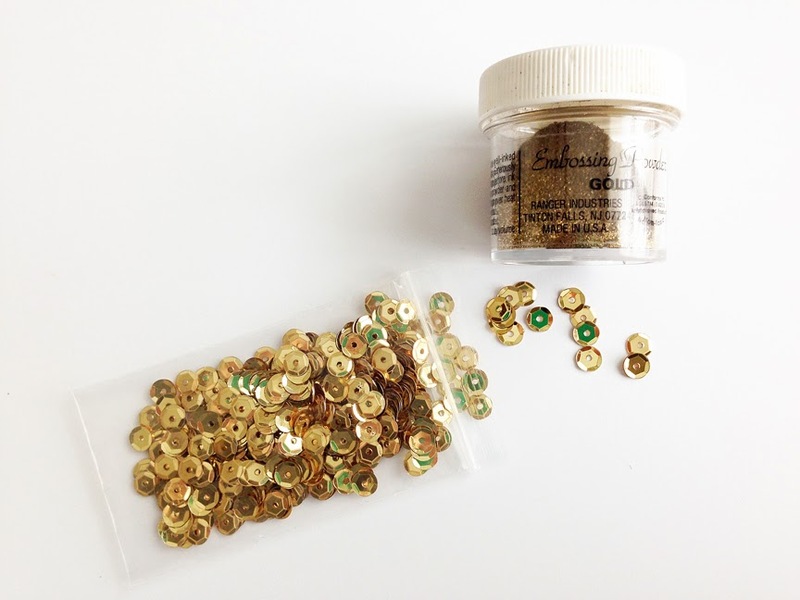 OTHER: sequins by Pretty Pink Posh, gold embossing powder by Ranger Industries. 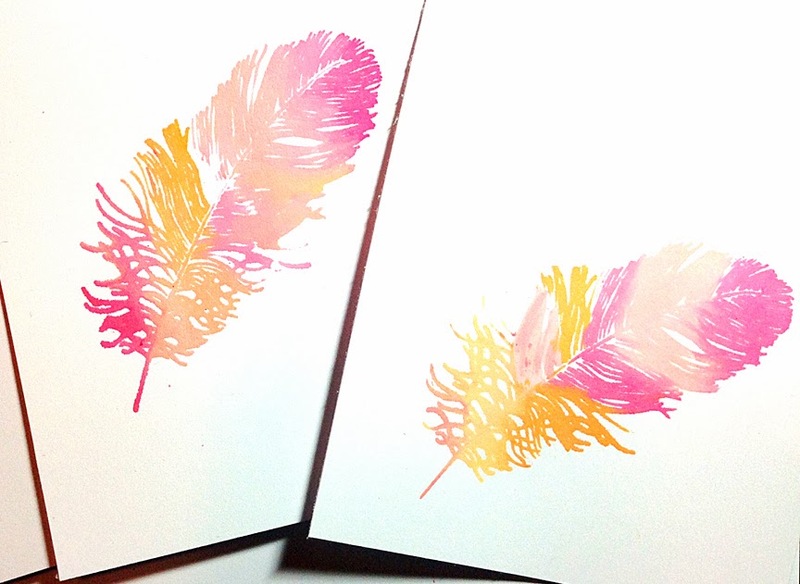 Feather Finery will be available for purchase on Jan. 15th at 10pm EST at Papertrey Ink. Visit the rest of the PTI team to see more samples made with this set! Oh, how fabulous! I especially love you watercolored notes. Just awesome! Beautiful cards once again, Danielle! Love that watercolor technique- stunning result! Absolutely stunning. Gorgeous colors - beautifully topped with the gold dots. So clean, yet so much impact. Your watercoloured look set of cards are so beautiful. Love. Beautiful Danielle, thanks for the tips!!!! Just beautiful, Daniella! Dawn Y.
Oh, these are stunning, Danielle! I'm so excited for this set! 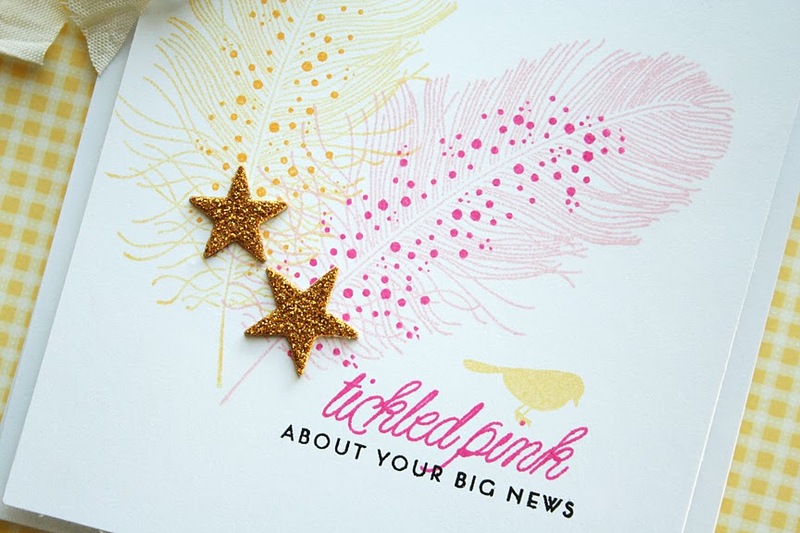 I especially love the watercolour feathers you stamped -- gorgeous!! Danielle, both your cards are absolutely gorgeous. I'll have to try that second technique. Love the colors you selected, too. 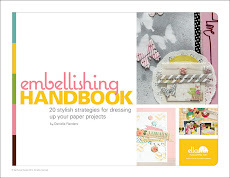 STUNNING - thank you, so very much, for th wonderful hints and tips! Love your watercolor effects today! Fabulous cards! I really like your watercoloring!!! Annnnnnd that's my favorite Danielle post ever. Beautiful. Nailed it. Oh, Danielle! This is stunning!!! Wow, wow, wow - simply stunning. 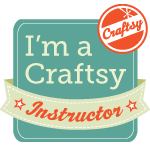 Danielle, loved your detailed instruction! The result was a work of art! This set looks addicting. Can't wait! Beautiful cards, both! The water colour effect is simply stunning! Brilliant and beautiful! I love your take on the watercolor concept. Wow, Danielle! 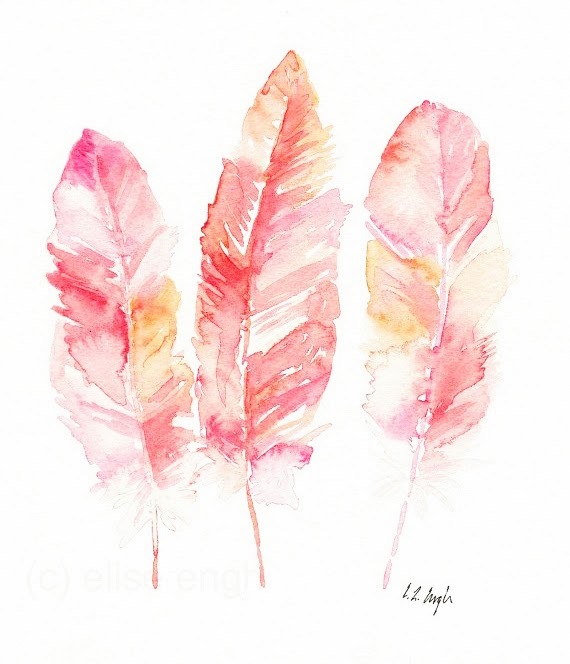 Your watercoloured feathers are works of art. Totally love. Both cards are stunning...thank you for the extra pictures detailing the process! Absolutely stunning Danielle! Love what you have done with this set. Beautiful designs and colours. 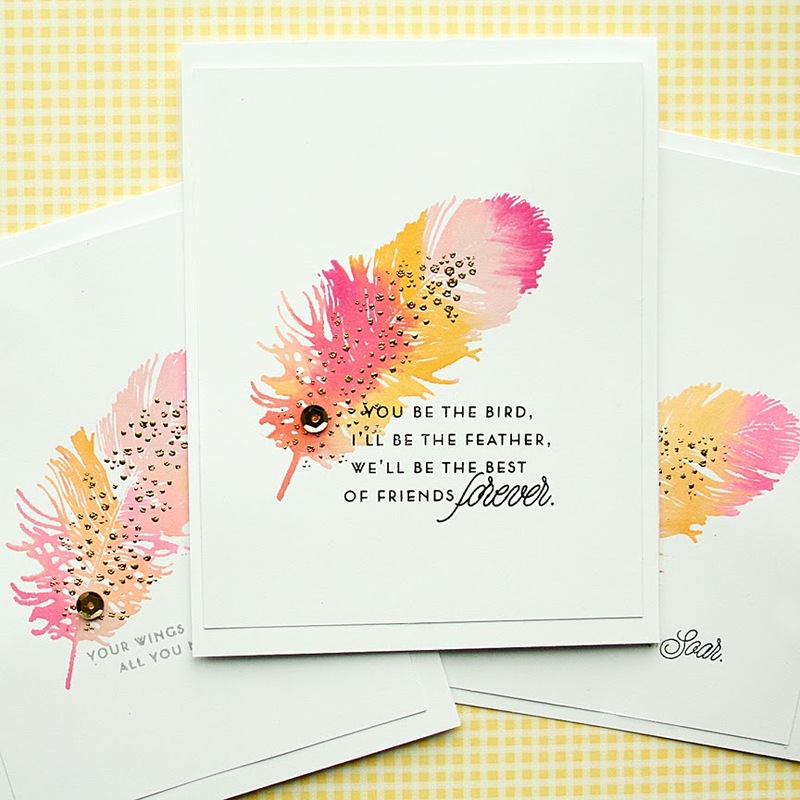 I am drooling over these cards.. love the soft colors you've used.. adore these feathers!! Absolutely stunning, Danielle! Both cards make me smile and for different reasons. Your watercolor technique really turned out a beautiful card and would make a perfect card set with different sentiments. Lovely! Absolutely love the water-colored feathers. Truly inspirational. First beauty... exudes happiness. Love the sentiment in pink! 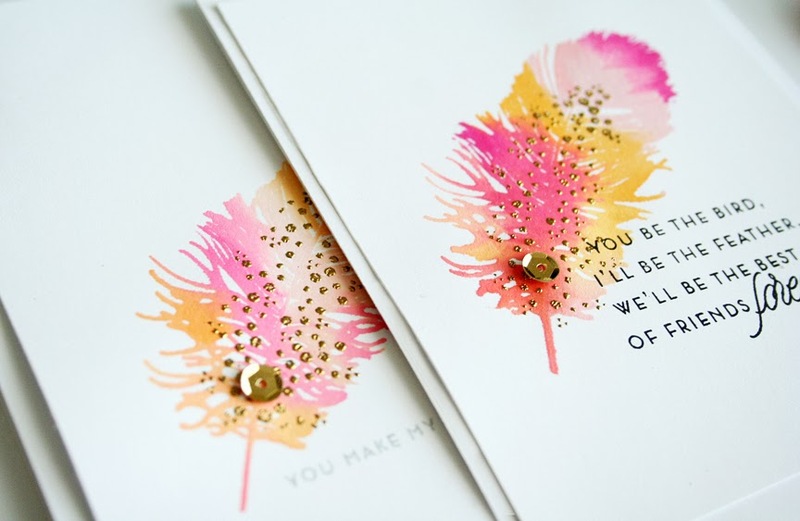 Second beaut... watercolors and gold embossing = love. What stunning cards!! 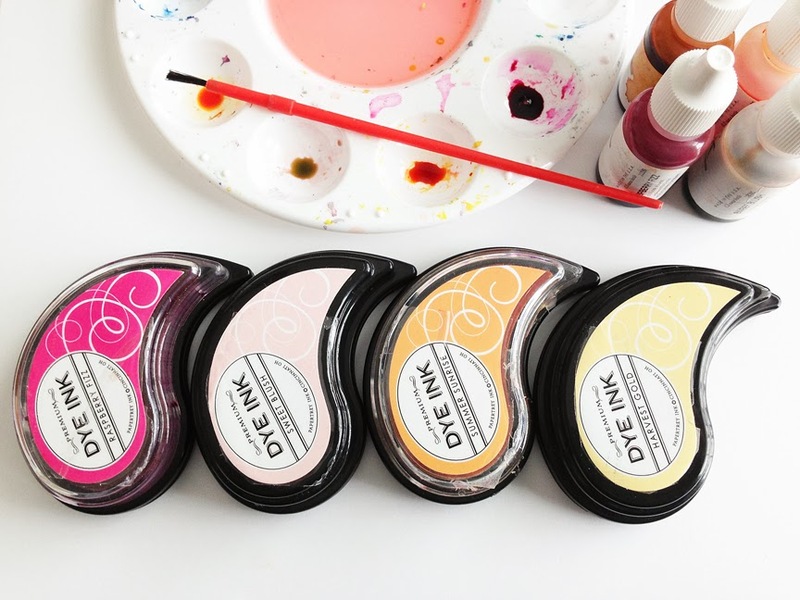 I LOVE the watercolor inspiration and how you used the re-inkers to color your stamp. So fun!! My fave cards of the day, these are lovely, Danielle!! 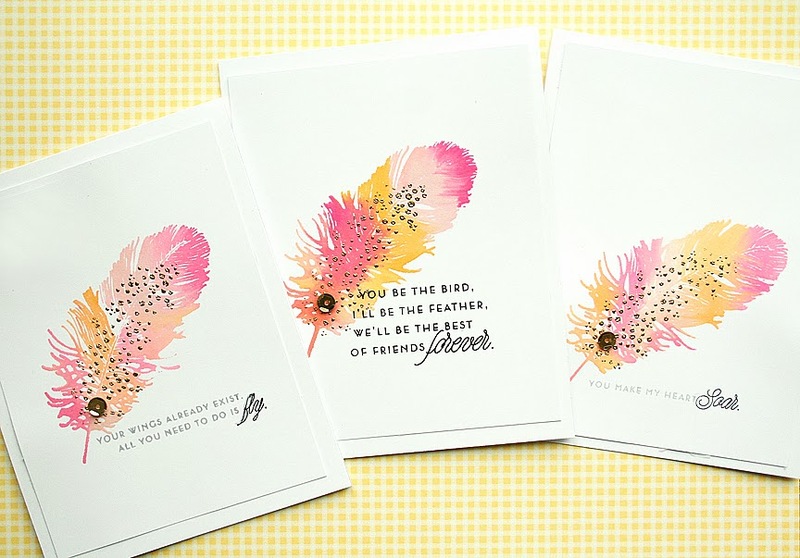 Your watercolor feathers are my favorite of all of the samples of the new set! Great job! WoW! This is simply gorgeous!! Danielle these are stunning! Awesome job! gorgeous!! omg!! im so new at stamping, can you tell me what you used to make the dots? you mentioned a dot stamp? but i dont know if theres a common one that you might have used? thanks so much for your inspiration!! Another inspiring post...love your artsy style!